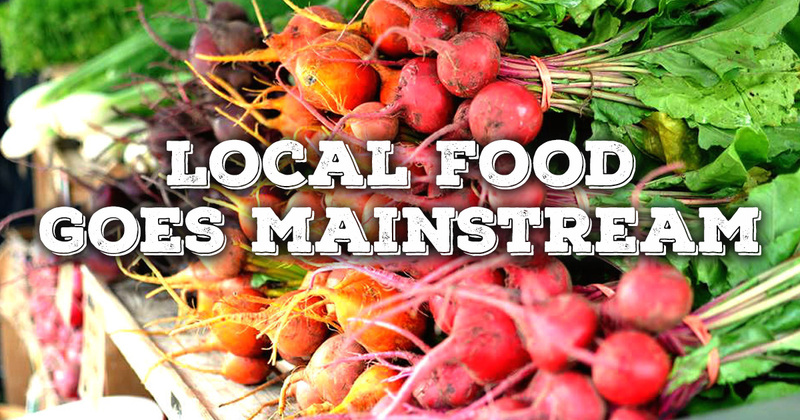 Local food is no longer just for “foodies” at the fringe of the food system. Local food is now part of the traditional food system. This is a good thing! This is where the next wave of growth will happen in local food over the next 10 years. This point was brought home to me in the last few weeks at the Farm to Table conference in Pittsburgh which joined forces with the Home and Garden show this year. The Home and Garden show brings in 100s of thousands of people from across the region to see 1800 exhibits in 10 acres of tradeshow space. It is a spectacle to see! And the Farm to Table conference is now simply part of it: we are rubbing shoulders with mattress salesmen, roofers, and European massage chairs. Local food is for everyone now. Local food is at Wal-mart and it is in our schools. We are no longer an alternative to the existing food system. We are now the food system. This is aspirational, of course. We are just entering the mainstream and there is so much work left to do, but I believe we need to act like we belong. To continue to grow, we need to innovate. We need to think about convenience, price, and the offer we are putting in front of consumers. We need technology. We need farmers who are ready to take the calculated risk to scale up their operation. We need to spend more money and energy on marketing. What worked for the “true believers” (0.5-1% of the population that has supported local farms) will not work as we aim towards 5-10%. This next slice of the market has different expectations and needs. Harvie is my contribution to this effort, but it is going to take a multitude of innovations to make local food an every day part of our food system. What are you doing at your farm, in your business, or in your organization to take local food mainstream? Previous PostPrevious CSA Day is this Friday!